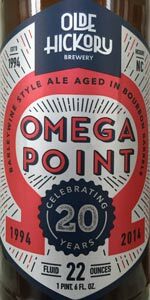 Omega Point is a bourbon barrel aged barleywine. It was blended from multiple vintages of barleywines aging in a variety of bourbon barrels. Some of the vintages have been resting in barrels as long as seven years. The result is a thick and rich treat that we are proud to share with you as our 20th anniversary celebration. Aroma dominated by chocolate, tobacco, leather, port, sherry, and bourbon, with a little bit of a smoky, amaretto twist to it that adds some additional complexity. Taste is so smooth; bourbon forward and subdued sweetness, giving it a dark chocolate and port-like characteristic. What a beauty. Consumed April 2017 - Poured a dark, brown color with a small, tan head head. Smelled of brown sugar, dark chocolate, raisins. Taste was so complex. Everything from the aroma plus oak, vanilla and dark fruits. Poured from a 22oz bomber into a speiglau BA glass. Look is a dark dark cola with red highlights and absolutely no head. Aroma is the most chocolaty vanilla beer I've ever smelled. Lots of deep deep bourbon in the nose. Taste is more of that rich barrel and less of the chocolate. A perfect blend of intense barleywine and bourbon barrels. Can't believe how good this is. Absolutely loved this beer ! Pour is a sludgy red/brown with barely even a whisper of bubbles that are gone immediately. Nose is of candied dates and caramel. The taste like the nose, but with the addition of a sweet chocolate. Superbly smooth and viscous as it washes over the the tongue. Really a remarkable beer. Way more than I was expecting from this.